It’s nice to see the some of the elements in colour on the front. Norah’s swimming suit looks great and the colour work really enhances the image taken from the story inside. 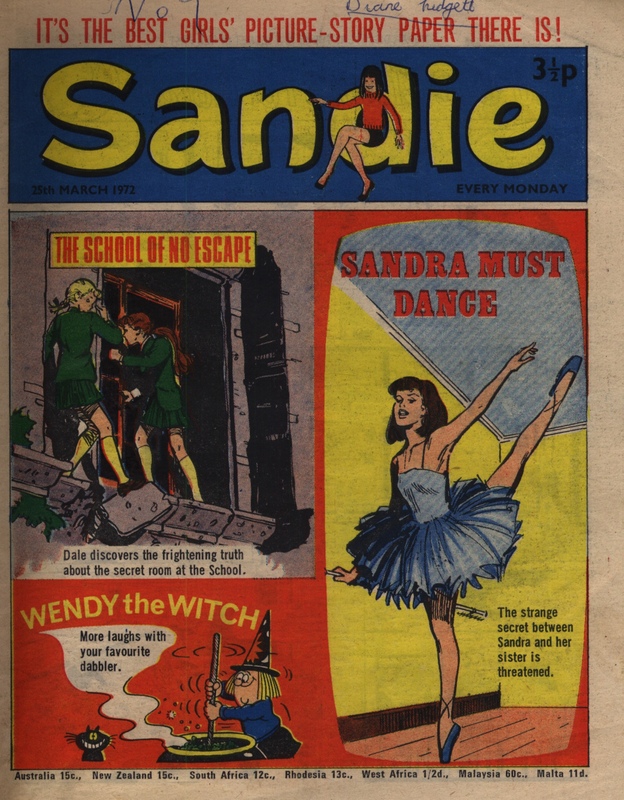 Last week’s cover showed us Sandra the ballet dancer with brown hair, which looked rather nice. Imagine if this had been published by Marvel in colour inside and out – somehow it seems to make a difference to how you see a character if you imagine them with a different hair colour. Norah’s cousin tells her that her father is a crook who stole money from the swimming club – and Mrs Maddox believes the story, because she knew him when he was the secretary of the club. She will carry on being Norah’s supporter and mentor though, as she can see that the girl is not also a crook. Susie Mann thinks the head of the school is living luxuriously at the school’s expense – and the glimpses we catch of the head’s sinister sideways glances have the reader thinking that it must indeed be so. Anna and her friend Julia have managed to get Mr Crossley to come and talk to the estate dwellers in person – but Ramage has manged to poison the well against the estate owner and he is not well received. Dale is made to drink a mysterious beverage when she is spying on Miss Voor – but she is helped by Eva, who seems to be at least a bit on Dale’s side against Miss Voor. In “Wee Sue”, she has to deal with machinations by Miss Chivers who wants her niece to be sports captain instead of Sue – and who is threatening to evict Sue’s mum from her home if Sue doesn’t go quietly. It’s the last episode of “Little Lady Nobody”. Lady Elaine has been found guilty of being an impostor and is sentenced to be transported for life – but in the nick of time, Sir William Moresby is found alive and on his way home. All comes well at the last moment. 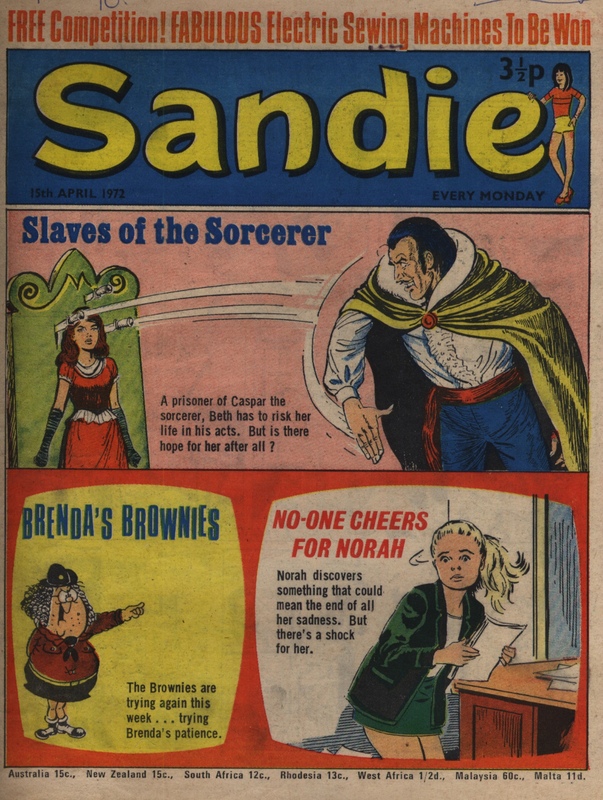 An advert tells the reader that next week’s new story will be called “Slaves of the Sorcerer”. Sandra is dancing superbly well most of the time but her rival does manage to get the wheel-chair bound twin sister out of the way for long enough to nearly put the kibosh on the dancing twin’s chances in front of the great Dame Valerie in the audience. Trudy finds out that her sporting rivals have gone to the lengths of trying to poison Silver by slipping yew tree leaves in his feed bag – they really are sinking low. See also Mistyfan’s previous post on this issue. Norah’s horrible Uncle Philip tells Mrs Maddox an awful secret that makes her turn away from Norah – but what is it? Susie gets her school class to set up a fete to collect money to help out the school – knowing that doing so will make the school look shamefully badly run. Which it is. Anna tells Julia that Ramage the estate manager is behind much of the trouble between Julia’s father and the tenants. Julia will try to help, but in the meantime Anna is in danger. Dale makes herself a robe so that she can pretend to be one of a group of masked schoolgirls who seem literally entranced by the evil Miss Voor – but her costume may put her in danger. 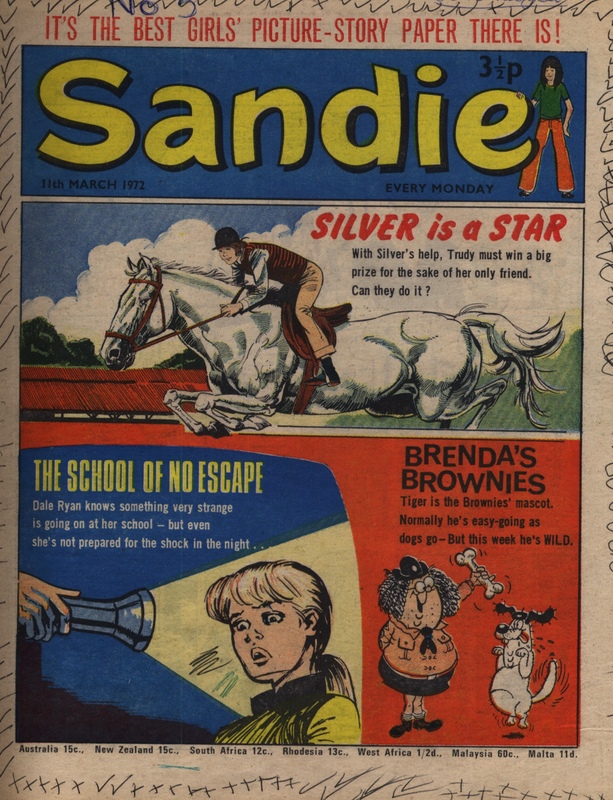 Wee Sue finds a way to save her school from being shut down in order for a motorway to be built through their land – all she needs to do is to ‘scale the wall of Swithers Castle without the aid of mechanical means’ (in this case by climbing up a pyramid of girl athletes). Elaine and Mary resort to blowing the lock off the door in order to escape the gruesome death planned for them by one of their many enemies – and in their escape they even find some friends, finally. Sandra and Joan have made up their quarrel and the psychic bond between them is operating at full force – so Sandra is set to give a super performance in front of Dame Valerie, patron of the Southern Ballet Company. Trudy ends up running the rag and bone cart in order to save Mr MacReady from worrying – but then her beloved horse Silver seems to fall sick. 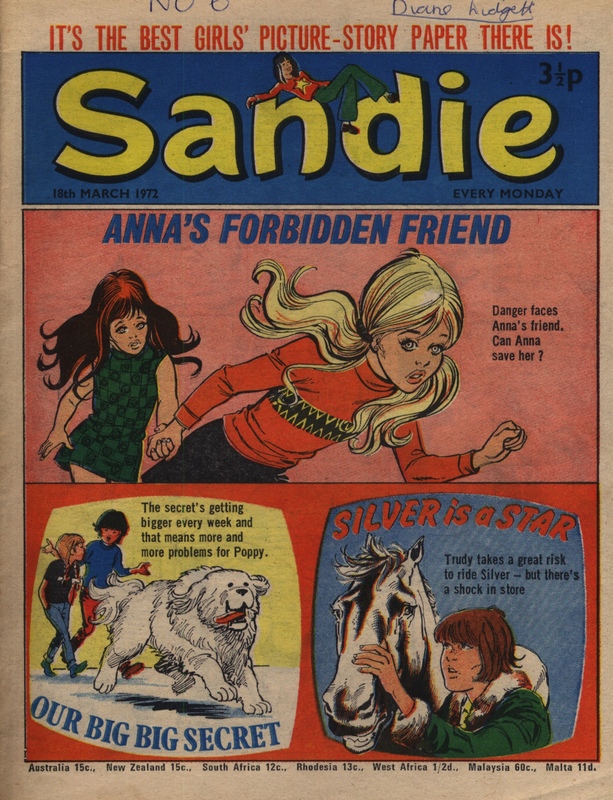 I am going to try limiting myself to a maximum of one sentence for each story (particularly focusing on serials) otherwise I fear that I will never get through the pile of Sandies, even though it was a relatively short-lived title. 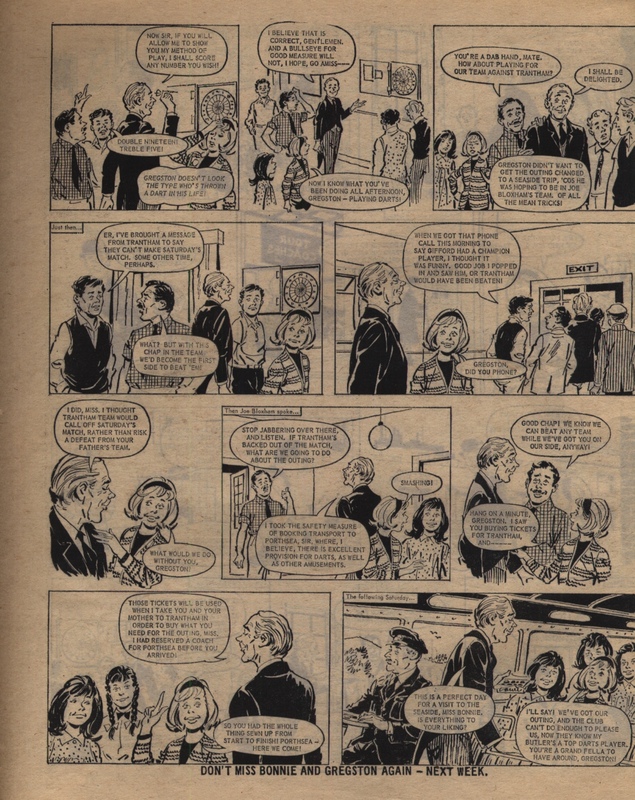 I aim to revisit the serials later in the format of story posts (as we do for stories printed in Jinty and elsewhere): a sample episode, story summary, and discussion of relevant themes and points. So even if the stories are not described in much detail right now, you will get much more in later posts. Mrs Maddox finds out some of the abuse that Norah is going through at the hands of her family: Norah is accepted into the swimming club as a non-paying member after all. Susie Mann discovers that all the school textbooks and other material are decades out of date, and decides to do organize a fete to do something about it. 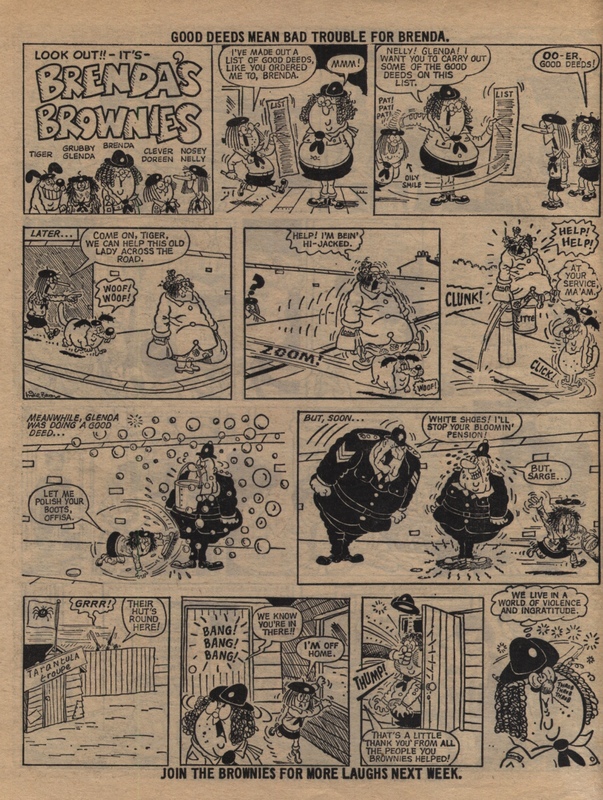 The episode of “Brenda’s Brownies” this week is particularly good: the last panel is my favourite, I think it really makes it. Julia helps Anna escape from trouble-makers at her housing estate, but the estate itself is banding together against Anna’s father who is planning to kick them all out, so tempers are rising. Dale finds a hidden room with CC TV and and witnesses Miss Voor doing mysterious things to their school mate Agnes. Wee Sue says she’s not that good at gym but with the help of a book she seems to master it very quickly. She seems a bit too much of a wonder girl, I must say. Little Lady Nobody is not far from an exciting close – Elaine Moresby’s life keeps on being threatened by the associates of her evil uncle. Will she get blown up in the latest attempt? Sandra and her sister Joan discover they have been tricked by an enemy who has been trying to separate them – they make amends and re-join forces to allow Sandra to keep dancing until Joan’s back is better. Trudy skips detention at school in order to ride in a race, which she would have won if not for the sneaky trick of her rival, swiftly followed by the medical collapse of her mentor Mr Macready. 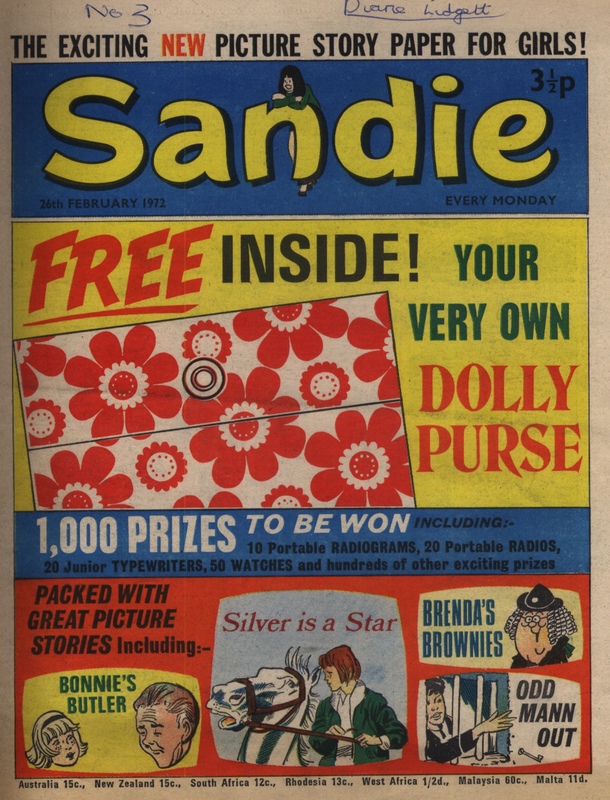 I am behindhand in getting back to these issues of Sandie – partly for personal / work reasons, and partly I suspect that I am making the description of each issue a bit too long to easily complete. Let’s see if there is mileage in cutting down the entries a little. 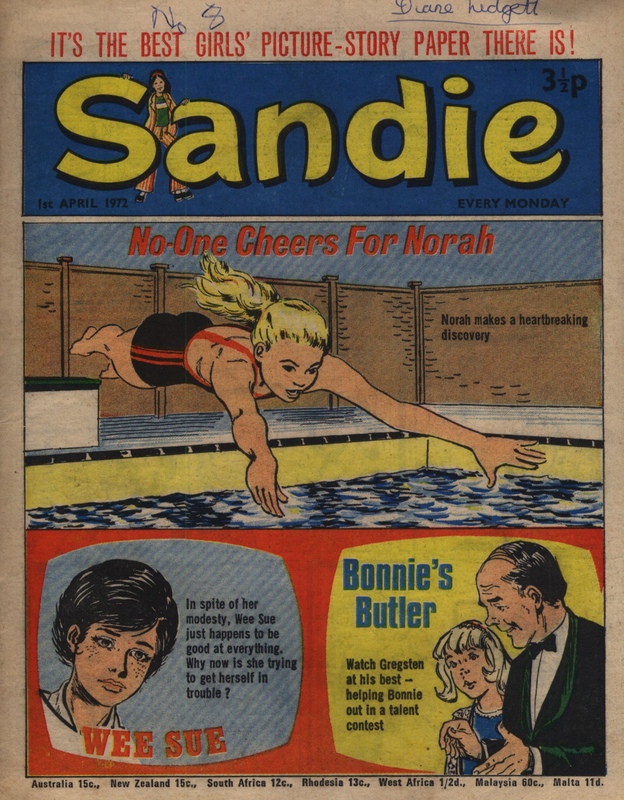 Norah is being nobbled by her cousin and family – Mrs Maddox is defending and supporting her but the cousin’s nasty trick in putting the clock forward by an hour may prevent Norah from succeeding in her swimming trial. Susie Mann is still championing the underdogs at her school, even against her own family. It is a real kangaroo court that her friend is facing! Very corrupt goings-on in this school. Estate Manager Ramage has made it look like protagonist Anna has pinched some fruit that she never did. Her family don’t really believe her, but the fact she says she’s friends with Julia, the landlord’s daughter, is the real clincher in their disbelief. Lots of sobs accompany this Quesada artwork, and worse is to come as the tenants of the estate are all given their eviction order. Dale has discovered something interesting with the stony-faced enforcers of Miss Voor’s – one of them is smiley and joyful as she sees a swallow flying. What’s that all about? In “Little Lady Nobody”, Elaine Moresby is still trying to get to the bottom of why her uncle wants to see her dead. She has a chance to testify against him in court (with it all rigged against her, of course) – but her uncle argues that it would be unfair to her friend Mary’s mother. What will Elaine do next? There is a voting box in this week’s issue, filled out by the owner. 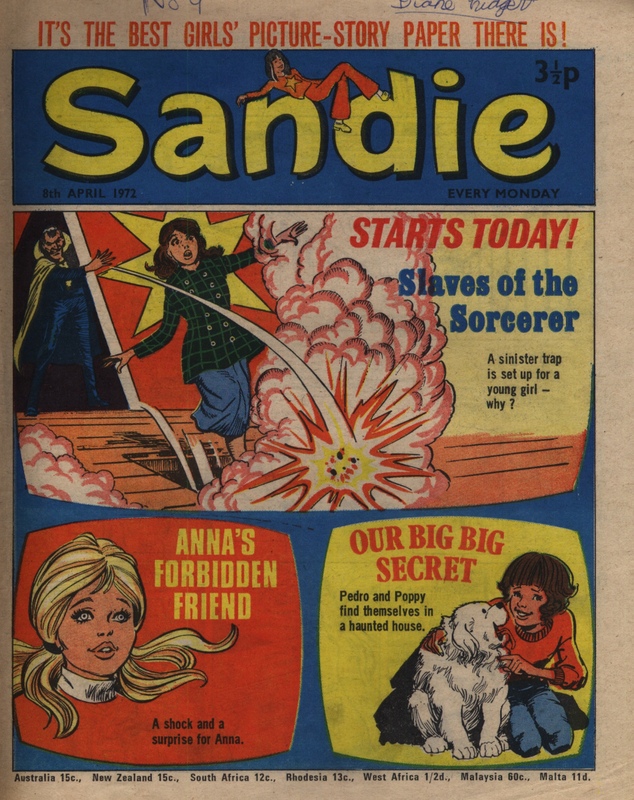 At this time, her favourite story was “The School of No Escape”, followed by “Wee Sue” and “Anna’s Forbidden Friend”. “Sandra Must Dance” – Sandra’s sister Joan hates seeing her twin dancing under her namme, even though Sandra is only doing it to support their gran. The psychic bond between the two girls falters, but Sandra is able to continue dancing because she has had more practice now than before. A secret enemy tries to separate them further via a forged letter – will it work? 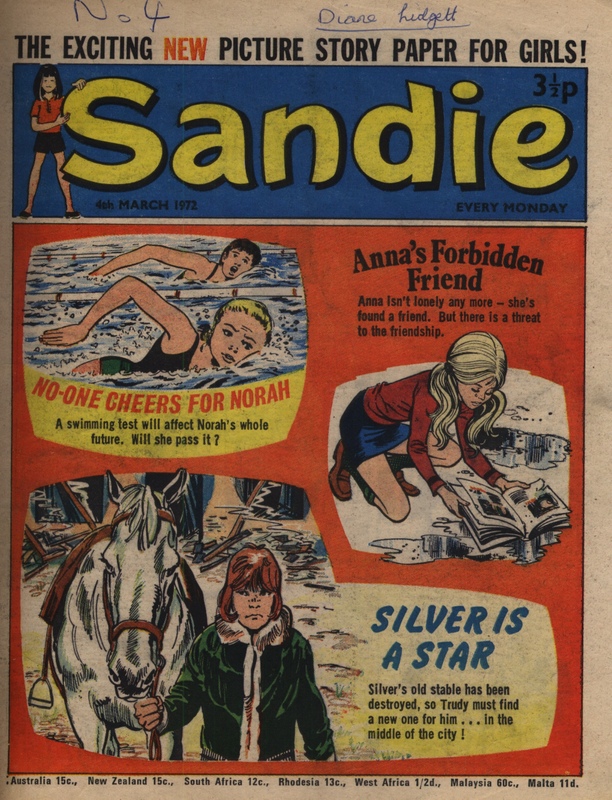 In “Silver Is A Star”, Mr MAcReady is out of hospital – though who knows if he is really as well as he claims to be – and Trudy is bidding fair to win her race – until the two snob rivals try to get her disqualified. Norah has to fight hard to win the swimming trial that Mrs Maddox has arranged for her to enter. The committee isn’t very impressed with her at first but as Mrs Maddox points out, she hasn’t had any training and still can battle the odds and win. She is allowed in on trial only, but that is more than enough for starters. Cousin Lorna is mad as fire, of course. And at the end of the episode, Mrs Maddox muses that Norah reminds her of someone… who could it be? Susie Mann proves to the rest of her form that she was ‘voted’ into position of Form Captain purely due to lies and deception on the part of the authorities. Nevertheless, she takes on the task of Captain, purely because she wants to lead her class into outright rebellion! By the end of the episode, her Head Girl sister is fuming. Anna sneaks out to see her friend Julia, who has had to listen to her father spout a lot of nonsense about how the kids from Madeley Buildings are a lot of hooligans. But it’s not the father that the two girls need to worry about – it’s estate manager Ramage who is putting every barrier in their way. Anna manages to get over the wall to meet up with Julia and give her a birthday present, and Mr Crossley even lets them have their birthday picnic, but Ramage makes up a story about Anna having stolen some pears and gets her thrown out in disgrace. Dale gets back late to her dorm room and finds that her friend Emily has disappeared in the way that other people have been doing – she has been replaced by a cold-eyed girl who says she is ‘the new girl’. A likely story! Miss Voor is still setting tests for all the girls and this time they have to solve a difficult riddle. Dale solves it, but only to hide the prize so that no one else can find it, because she is worried about the whole set-up. Soon there is another challenge when Dale and her other friend Daphne sneak into Miss Voor’s office – they find a box with a big initial V on it. Does it hold the answer to the mystery? The two girls in “Our Big BIG Secret” continue to hide the fact they have become owners of a very large dog, and hillbilly Lucy continues to astound polite society – this time with her pet skunk. But the skunk did save Locksley Hall from burglars at least! Wee Sue saves the hockey game, and even fixes the engine on the bus on the way back from the game. Too clever for her own good, as her friend Kay says? Not half! Elaine is saved from being run down by Miss Pettifor, the headmistress at the school she was at before her father’s ship went down. The worse discovery that Elaine makes, though, is that it is her Uncle Ned who is behind the attempts to kill her! Along with her friend Mary, Elaine tries to enlist the help of her old acquaintance Patricia Millard, but to no avail – and indeed her old friend tells her to her face that Elaine “has been dead these past three weeks!”. 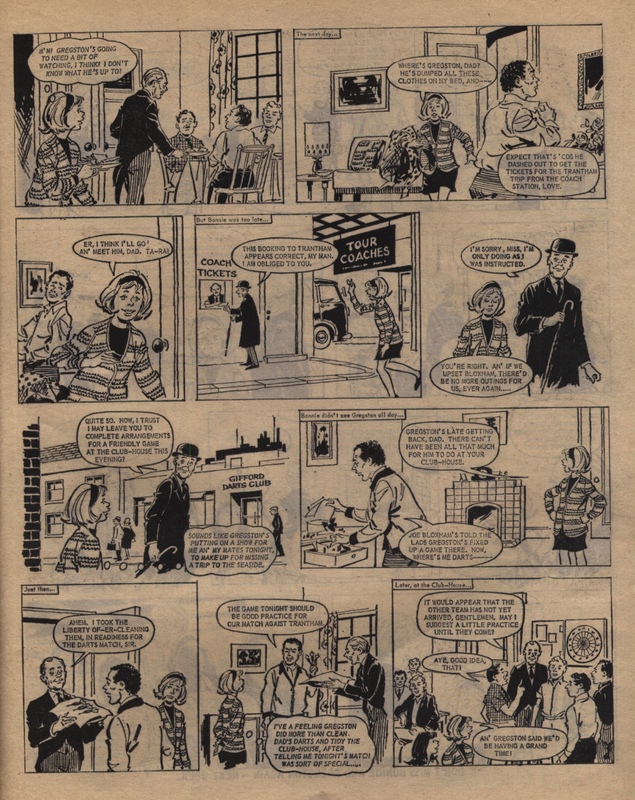 We have two Mike Brown strips in Sandie at this time! “Wendy the Witch” is also on the go. To defeat a bully, she zaps a baby with a spell: “Oh, baby with the lolly – be big, but not jolly!” and Big Bully Bab gets her just desserts at the hands of said enlarged tot! Sandra and her sister are increasingly on the outs. Joan wants to get her strength back to do her own dancing again, but they both want to keep their grandmother happy and she thinks that it is Joan doing the super dancing. Joan is indeed dancing, or at least trying to recover her strength – but as the nurse warns, if she tries to rush things she may lose all chance of ever being able to dance again. Trudy finds out that Mr Macready isn’t dead or dying after all, but is worrying so much about her that she was called urgently to his bedside. When she gets back to the scrapyard she finds two of her rivals poking around the rickety ruins – so rickety that it promptly collapses on them. They need to be rescued – partly due to Silver pawing at the rubble and attracting the attention of helpers. Now Trudy needs to find a place to stable Silver overnight, to no avail – and when she returns to the hospital she finds that Mr Macready has disappeared! Norah has a go at swimming in the local lake, which she’s not supposed to do – she attracts attention from various people, but luckily also from Mrs Maddox, who is not angry but rather offers her a visit to her house so that she can clean up and even have a try at her swimming pool instead… The quality of Norah’s swimming interests Mrs Maddox greatly and she asks Norah to the local swimming club for a trial. Cousin Lorna is far from pleased! Susie Mann is wreaking havoc of all sorts. The other schoolgirls in her class are not totally sure what to make of her. She gets one of her classmates released from the cooler where she was unjustly locked up, but the headmistress conspires to get Susie elected as new Form Captain despite all her protestations. The Head is trying to make sure that power will go to Susie’s head – she doesn’t know who she’s dealing with, I think. The creepy Miss Voor has got a bunch of cold-eyed clones to staff the school alongside her. They are working as teacher’s aids in each class, but they very much have their own agenda. For some reason they want to find the ‘best’ at everything – the tallest girl in class, the best at knitting, and so on. But there is more going on – at night, Dale finds that her room-mate Emily has been replaced by one of Miss Voor’s creepy clones! Poppy and Daisy Mason find a nearby old lady who will happily look after their huge dog for them, but he is too clever for the old lady and soon escapes. If Poppy and Daisy’s parents find out about Pedro, he’ll be for it! Hillbilly Lucy is sent to a snobbish school, but no one there is kind and sympathetic. Guardian Lady Primrose takes the snobs down a peg or two. Wee Sue is worried about her French – she has learned a lot with Kay teaching her (even though they were playing hockey at the time!) but there are still big gaps in her knowledge. Sue is caught out of bounds while trying to study at night, and the hockey captain stops her from playing in the big hockey game the next day – she substitutes pal Kay instead. Sue knows this is not a good idea, as Kay isn’t a great player and the captain is just trying to show her up, but Kay takes Sue’s comments the wrong way and thinks that Sue has turned against her. Little Lady Nobody is pushed down the well, but she clings onto the rope and avoids falling all the way into the well. Fellow servant Mary saves her but Elaine immediately betrays her. Mary falls ill as a result but Elaine makes up for her betrayal by being staunchly by MAry’s side during her illness. The other servants are won over, too – at least somewhat. Sandra continues to dance on her sister’s behalf, but now her sister is jealous of the fact that all the kudos is going to her sister, and not to her. But they are both doing this just for their grandmother – it’s not a comfortable deception for either of the twins. Bonnie’s Butler wins out again – Bonnie’s mother goes out for a posh evening do, courtesy of Gregston, rather than the trip to see a horror film that Bonnie’s father had planned. Trudy rescues Silver from the burning stables but her friend and mentor is struck down with a heart attack. Now she doesn’t know where she can keep the horse; but her immediate concern is overwhelmingly about her friend, Mr MacReady. 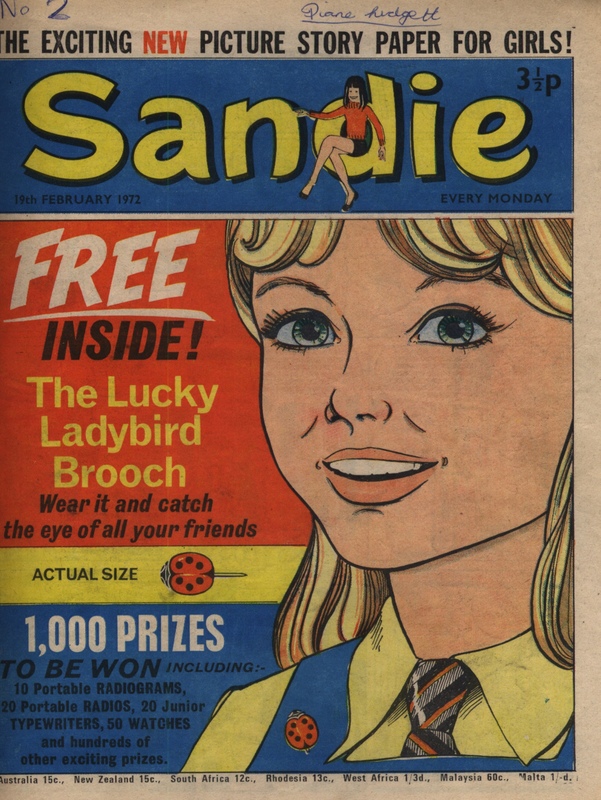 There seem to be two copies of Issue 2 in this box I have just received – one nice clean copy as above (though with one coupon cut out, affecting the “Brenda’s Brownies” page but nothing else), and one with a couple of ladybird badges drawn over the cover girl’s collar and, rather disturbingly, on her neck! There is also one of her teeth fetchingly blacked-out. Not a mint copy! Norah is keen to join the local swimming club, but her no-good cousins are trying to shut her out. They have just told the wealthy president of the swimming club that Norah is the ‘new help’ – but it does mean that the kind words that Mrs Maddox says to Norah are received with true emotion. Of course Norah isn’t going to be able to join the pool so easily – cousin Lorna tears her costume into rags and tells her it costs far too much money for her to join anyway. The school started and run by the Manns is looking rather more sinister than in the first episode. Susie Mann is trying to stir stuff up and show she isn’t interested in becoming the next Head Girl or whatever, but her prank gets another girl landed in the cooler instead. And it’s a literal cooler – down in the dungeons, set up like a prison! Susie is having none of it, but how will the powers that be take it? Anna Martin lives in a block of flats in the East End of London. Her only interest is in bird-watching. Everyone else teases her and destroys things to do with her hobby (a book, a nesting box). It looks like Anna will find a friend who may share her interest – but probably someone related to her nasty landlord, Mr Crossley. At St Junipers, new headmistress Miss Voor is being very odd. She catches rebel schoolgirl Dale out of doors at night and just makes her climb back up the ivy into her dorm. Next thing she does is to tell the girls that half of them will get no lunch and the other half will get double helpings. ?! Dale organizes a strike to share out the food, or (once Miss Voor prevents them from doing that) at least makes sure that if some have no food, then all will refuse their food in solidarity. But oddest of all – the last shot shows a group of tall, stern women in Miss Voor’s office, all looking very like her, and all with the same cold blank eyes as this weird woman! The two girls have named their big secret – the dog is called Pedro. He’s not happy at his sleeping accommodation, and ends up getting his way and sleeping in Poppy’s bed, while she has to bunk up with Daisy. Wee Sue is preoccupied because she isn’t great at French (they didn’t do it at her old school). She is a scholarship girl so is worried about losing her place if she can’t keep up in lessons, but in fact the headteacher and others seem more interested in her sporting prowess. Luckily friend Kay teaches her French – during the hockey! It works well and Sue’s team wins. Historical sob-story “Little Lady Nobody” turns sinister quickly. Elaine learns that her second day as a skivvy will be rather worse than her first as she is nearly suffocated when a fire is started while she is up a chimney – and later when she goes to fetch water from the well, she is given a hard push from behind! Sandra discovers she can only dance well when her sister is nearby, willing her to do so. Neither of the twins want to disappoint their grandmother so they both continue to collude in the deception, even though it means trying to ensure that twin Joan is wheeled to the theatre by their unsuspecting gran. Will it work? 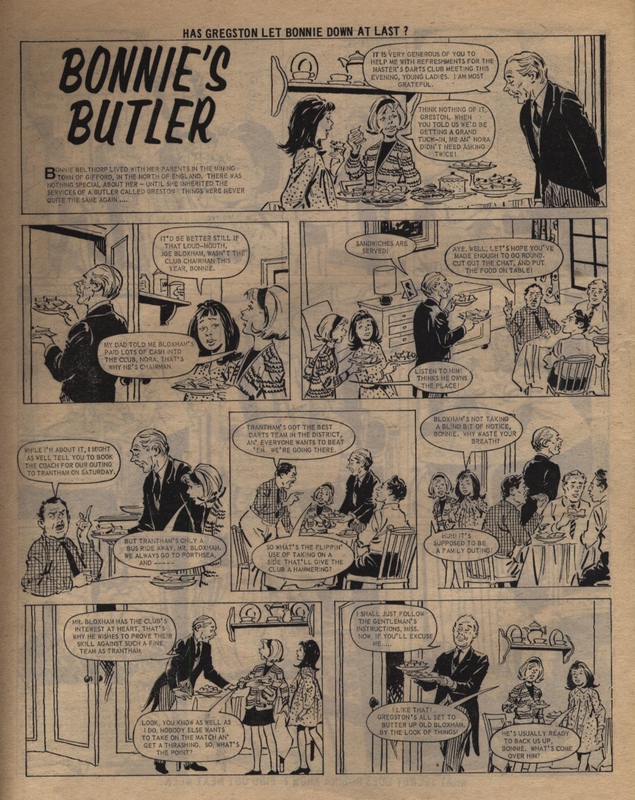 Bonnie’s Butler continues to be a quick-witted helper. This time he makes sure that Bonnie and her school pals triumph with their school task of making jam puffs. Trudy enters Silver into a showjumping competition, but he’s not been trained to jump and muffs it badly. Scrapmerchant Mr Macready is a helpful mentor, but tragedy strikes as a fire breaks out in the stables where Silver is bedded down for the night.